In April, 1906, Santa Rosa was a small town of about 10,000 and everybody pretty much knew everybody else. Now everybody knew somebody dead. Milo Fish, the pressman [for the Press Democrat]... was dug out while alive but succumed [sic] to his injuries shortly after being taken to his home. He leaves a wife and six children. The charred remains of Mr. and Mrs. F. W. Carter were recovered this morning. The bodies of three unknown persons were brought to the Morgue late Monday evening, having been found in the stairway to the Princess lodging house. Nothing could be learned of their identity. It is supposed to be a man, woman, and child. The remains of a woman, supposed to be those of Mrs. A. S. Rogers, were taken from the Reynolds building on Third street this afternoon. The remains of a man supposed to be Contractor Richards of San Rafael were discovered in the ruins of the Occidental Hotel, and were taken to the morgue in a small box today. 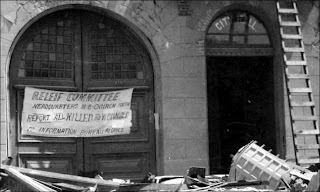 The body of Charles Shepard, the last of the three Press Democrat carriers who lost their lives in the catastrophe, was recovered this morning from a pile of ruins across the street from the press-room door. The poor boy had evidently rushed out of the building with the others, and had gotten clear across the street when he was caught by the falling walls. All the debris in that vicinity had been worked over in the effort to locate the body, but it was not until this morning that it was recovered. Four of the Press Democrat employees, three carriers and a pressman, lost their lives as the result of the earthquake. Carrier Shepard was seventeen years of age. [T]he remains of a man were found in the ruins of the Eureka Lodging house on Fourth street. With the remains were a few coins and the remnants of a watch. Those days were a swirl of confusion, and the town's newspapers, struggling to publish anything at all using a small newsletter press owned by the business school, reported events as well as they possibly could. But mistakes were made, even about something as serious as the finding the dead. The body of Smith Davidson, for example, was found twice, presumably in different locations. 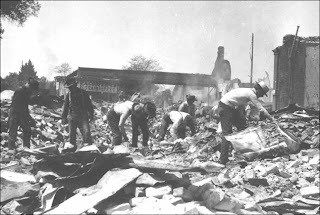 On the 21st, it was noted that "the remains of Smith Davidson were recovered this morning from the ruins of the Kinslow building above C. A. Wright & Co.'s store." Then six days later, "A portion of a human body was found in the ruins at the entrance to the stairway leading to Mrs. Loughery's rooming house this morning. It is supposed to be the remains of Smith Davidson." Then there's the mystery of "Miss Excela," part of the "Sensational Gun Jugglers and Fencers" act that was appearing at the Novelty Theatre that week. The April 19 death list listed "Miss Excelsa, Novelty theatre," then two days later, "The remains of Miss Excelsa, the Novelty actress, and a little girl, identity unknown, were found this morning and taken to the morgue. The body of the latter was taken from the ruins of the Ramona lodging house." In the April 21 newswire list of Santa Rosa's dead - and which contains some details that did not appear in the Santa Rosa paper - she became "Miss Excelia." Finally, she appeared as "Excelsa, Miss, Novelty actress and child" on the death list that appeared in the April 30 Democrat-Republican. Presumably "Miss" was not her given name, and Excela/Excelia/Excelsa was a stage monicker, but I've been able to find nothing about her. (Update: her name was Ceile Heath.) There was no mention in the paper about the bodies being shipped to somewhere home, no article in the multitude of digitized newspapers about a local woman and her child dying in the famous earthquake, and given that vaudeville acts that played the Novelty Theatre were Gong-Show quality, there are not even any reviews of the act. And was that even her daughter? The following lists also have an entry for "Little girl (unknown), Ramona Lodging House," which is probably the same child being counted twice, but is all the more mysterious because the girl is listed with no name whatsoever. There is also the disappearance of Fred Thurber; nearly two weeks after the quake, the following item appeared; apparently his whereabouts are still unknown. Who knew Fred Thurber? Inquiry has been made here for a man named Fred Thurber, supposed to be among the missing of the Alma lodging house ruins. Any one knowing whether or not he was in that house on the night of the disaster will kindly communicate with Mrs. Cunningham, Dutton avenue. The parents and two daughters of the missing man are anxious to get some tidings regarding him. 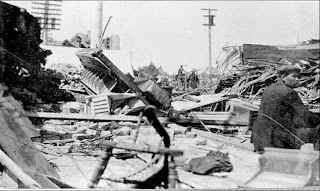 A letter from Mrs. John Rhoades appeared in the May 3 Fayette, Iowa newspaper: "...The loss of life in the three large three-story hotels was great and can never be known definitely, as fire finished what the earthquake left, including the registers [emphasis mine]. They claim that there were over one hundred guests in each hotel. As to that I cannot say; however there were a great many rescued alive. Besides the the first-class hotels there were four second-class hotels that were also full and shared the same fate, besides six or eight lodging houses, all filled. It is estimated that between three and four hundred people lost their lives, but as I said before I doubt very much if we ever know..."
There are accounts of other deaths that may be apocryphal. One of the postcards created by M. Rieder has the caption, "Wreck of Haven Hardware Co., Santa Rosa, Cal. Where powder exploded killing eight rescurers [sic]," but the Democrat-Republican newspaper did not mention such an accident. Then there was the letter that appeared in New York and Los Angeles papers claiming, "...From the St. Rose they took out nine bodies to-day. They found a little girl in these ruins. She was unhurt, but very hungry and thirsty, having been buried four days and nights." The Democrat-Republican newspaper did not mention a dramatic late rescue or the discovery of a large number of casualties found on April 21, but no paper was published on Sunday, April 22 - was this news that fell through the cracks? The first frontpage that was printed, just hours after the calamity, offered an advance apology: "The lists of dead and injured given herewith are necessarly [sic] very incomplete, but will be made complete as rapidly as possible. There were many narrow and thrilling escapes, but the limited facilities for publishing a paper after the awful devastation prevent even a mention of these at this time." Sadly, the papers never got around to telling us about those "narrow and thrilling escapes," which were too few, or printing an accurate toll of the dead, which were too many. A young woman named Jessie Loranger wrote to her sisters a couple of days later, "Clarence went to the cemetery this afternoon & worked like a man digging a trench and helping to bury seven corpses. Tonight he has blisters on his hands but feels he has done his duty. A great many don't do their part. Pa painted the names on boards for marking the grave. He used a little brush of Sybilla's and a little paint Charlie had at home." 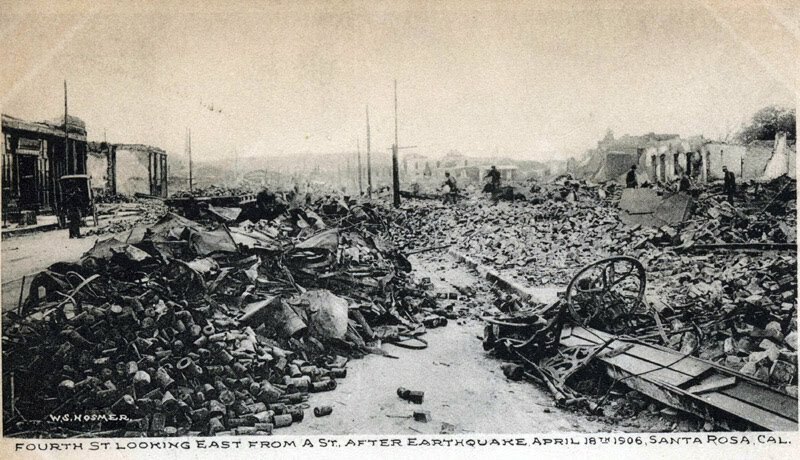 Also from the letter of Mrs. Rhoades: "There were forty bodies buried here yesterday [the first Sunday after the earthquake]." Seven of the bodies of the unfortunate victims for whom no private arrangements could be made were interred in one big grave Friday afternoon, for the present at any rate.